In California, Bauer, Lorang & Sherman measured erosion from several types of boat wakes. They took a 7.5m (25') boat past a cohesive clay/silt bank, at various speeds, and measured the erosion. The site was on the Georgiana Slough of the Sacramento River near Walnut Grove, California (38.21N 121.54E), with a "cohesive clay and silt mixture" and a "bulk density" of 125 lbs/cubic foot. Their instruments were sensitive enough to see the sediment washed into the water from each boat passage, so they can say that their boat on plane at 27 mph, erodes four thousandths of an inch per passage (shown in table above). Another way to look at the erosion is to say that just one boat speeding once for one mile (2.3 minutes) removes 3.5 square feet of bank (1.7 on each side of the river), or more than one and a half square feet of bank per minute. In 20 afternoons, 20 boats would remove 1,400 square feet of bank per mile. The volume of sediment carried downstream depends on wave height and bank height. If erosion proceeds on a face 6 inches high, including the bank above & below water level, 700 cubic feet will be carried downstream, or 44 tons. Even at slow speed, 7 mph, the same boat would remove a quarter as much bank per passage as at 27 mph. A spreadsheet summarizing the results is here. Maryland Dept of Natural Resources sponsored a study, which shows erosive energy from boat wakes in the Chesapeake Bay (graph & data & full study). They found that total energy from the series of waves in the wake of one boat does not decline significantly while the wave travels up to 200 feet across water. Distances over 500 feet were needed to reduce wave energy. 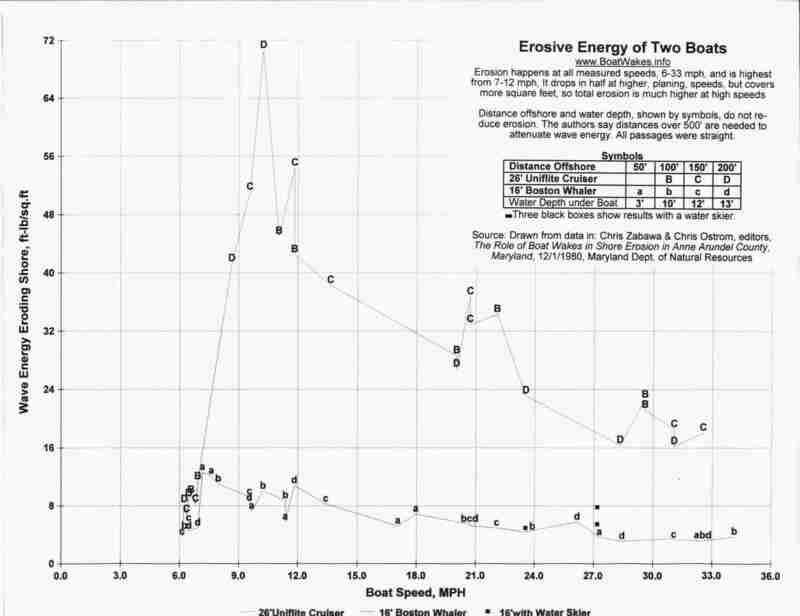 The most damaging wave energy came at boat speeds about 10 mph (9 knots) in a 26' boat, and 7 mph (6 knots) in a 16' boat. They noted these are just above Maryland's 6 mph speed limit, so a small error in estimating speed causes maximum wake. The effect of a water skier ranged from nothing to doubling the wave energy of the boat alone. At three spots, near each other (38.96N 76.58W), the shore was eroded 6.8 feet, 5.2 feet and zero feet during one year (pages 4-46 & 4-47). These three readings average to about a thirteenth of a millimeter of erosion per boat passage (.077mm). These spots averaged 326 boat passages per day on weekends (95 on weekdays) three quarters of which were 15-25 mph, the rest split between faster and slower. About half the boats passed 150'-250' away; a third were closer. Half to 2/3 were pulling water skiers. About half were less than 16' long; and 90% were less than 26'. (page 6-7) They calculated 72 days at this summer boating level, and a total of 52 days earlier and later in the season, at half that level, or 16,000 boat passages per year, which suggests a thirteenth of a millimeter of erosion per boat passage (calculations). Soils at the site were sandy. About 90% of each sample by weight were particles of sand 0.062mm to 2mm; 1-2% was silt .0039 to .063mm; another 1-2% was clay under .0039, and the remainder was gravel, over 2mm. Winds also create waves, but not much erosion. At the three spots mentioned above, 20% of all wave energy came from boats, and it was enough to cause significant erosion during the boating season. At other spots, where boats created just a few percent of all wave energy, there was little erosion, except in a major tropical storm, which suggests that shores have reached equilibrium with normal wind waves, and boat waves upset that equilibrium. The study experimented with boats running 50' to 200' offshore. They measured the height of the wakes with a gauge about 24 feet out from the shore line, in 2.2 feet of water. Thus they did not measure wave heights or wave energy created at the boat, but just before arrival on shore, since their goal was to measure erosive potential on shore. The gauge was a loop of Teflon-coated wire on a supporting PVC rod. The detector measured changes in capacitance between the wire and the conducting water as water covered more or less of the wire. Teflon was used as the insulator, "because of its high resistance to 'wetting' by films of water that would otherwise delay the response of the gauge in sensing the rapid fall in water level following the passage of a wave." (p. C-1) Tricker (p.116) and Nanson (p.6) also discuss measuring wave height by capacitance. The height of the largest wave in each wake, by the time it reached shore, was indeed related to distance. Closer boat passages (same boat & speed) gave a higher maximum wave. It appeared that the largest wave in a wake spread its energy to other waves in the same wake as they traveled over distance, so that total energy did not fall off, but the height of the largest wave did. This observation is consistent with theory in Doctors (2002 p.30, bottom line of each graph), where calculated wave heights decrease slowly with distance, but total calculated wave energy (sum of squares of heights) is constant in the full range where it was estimated (up to 1300 feet or 400 meters). They also measured that their 26' boat, passing 200' offshore at 21 knots, caused suspended sediments at the shore to rise from 5 parts per million (milligrams/liter) to 440 parts per million in the first wave, and then drop to 330 parts per million after 10 passes, presumably reflecting suspended sediment being carried out of the sampling area by currents and waves. Tasmania has a graph of erosion related to boat speed and wave type. It does not show numbers, but it shows a pattern of much higher erosion at planing speeds than slow speeds. They also say slow speeds need to be below 4 or 5 knots. They warn that many parts of their World Heritage area are off limits to power boats, and recommend in other areas that boaters educate themselves by periodically standing on the shore, watching it erode as power boats go by. Their major study reports on the Gordon River in Tasmania (42.54S 145.72E), which is so beautiful that tour boats take 110,000 visitors per year. For thousands of years the river has deposited more sediment than it took away, burying old riverbeds, which can still be found in excavations. That growth has now reversed. The commercial tour boats (there are very few individual boats) have caused major erosion of the riverbanks. The tours are popular, because they take visitors right into a wilderness area with "mist covered rainforest reflected in perfectly still waters" (p.14). Platypuses live in the banks; rare kingfishers, parrots, hawks, and black swans live there. Banks have built up along the river over thousands of years, with swamps and lakes behind them which are home to rare ecosystems: shallow lakes whose waters do not mix (meromictic lakes). Erosion before 1989 was rapidly threatening to breach the banks and wash out these protected lakes. "By 1986, continuous stretches of river bank up to several hundred metres in length had collapsed into the river, taking with them Huon pine and Myrtle trees up to 20 metres in height." (p.18) In 1989 three quarters of the river was closed to commercial traffic, and a speed limit of 9 knots was imposed on the lower part, which remained open. By 1994 erosion continued, so the speed limit was reduced to 6 knots for commercial boats. Erosion has slowed but still continues, so Tasmania is looking into limiting the size of wakes directly, rather than just speed. They expect tour operators eventually to use boats designed for low wakes, or the tours will have to stop. The present erosion carries off every year what took 10-100 years to deposit. Even wakes 20 mm high (.8 inches) cause erosion, so any significant boat access may be unsustainable. "After a trial period it has always been found necessary to introduce further restrictions." (p.19) The only sustainable level is considered to be zero wake-induced erosion. In some areas with well-protected banks, aircraft landings have been allowed on the river, but they destroy the quiet wilderness experience for others, and they still cause erosion. Water skiing and jet-skis are prohibited on the entire river. Non-motorized boats have not been restricted so far. "…some 80% of the total bank length of the lower Gordon River is affected by erosion and cruise vessels are considered to be the major erosive agents. "In natural fluvial systems erosion is expected to be concentrated on the outside bank at bends in the river channel, while inside bends are often depositional areas. However, the erosion on the lower Gordon River is generally more severe on the inside bank of bends where wash waves are concentrated by compression of the wave train generated by the turning vessel and by boats tending to cut corners and travel closer to the inside banks. In 1987 University of Wollongong consultants concluded that the bank erosion was almost entirely due to boat-generated waves and that the (then) recently introduced high speed tourist launches had accelerated and spread the problem. This hypothesis has been strongly supported by subsequent investigations and regular erosion monitoring. In 1998 they estimated 100mm of erosion per year in the lower river, open to commercial traffic with speed limits. (They actually measured 10 mm/year erosion, but they believed that was underestimated by a factor of about 10, since the most eroded areas were inaccessible undercuts, so measurements were made on more resistant areas.) In 2006 they roughly estimate about 20% as much erosion, 20 mm/year, because of better hull designs (catamarans) and speed limits (email). An update published in 2005 used a turbidity meter to count boat passages. The amount of turbidity (cloudiness from suspended sediment in the water) indicates the erosion caused by each passage. 82% of the suspended sediment was caused by commercial tour vessels, which therefore needed lower speed limits or better hull shapes. The other 28% was caused by fishermen (especially when they went fast at dawn or dusk to get to or from fishing areas) and individual tourists. These boats carry far less than 28% of the visitors, so their effect is disproportionate, and they also need speed limits. This turbidity monitoring provided an estimate of about 1600 boat passages per year, or .0125mm erosion per boat passage (20mm/1600). (This is consistent with the 110,000 visitors per year and boat sizes (up to 250 passengers), since 1600 boat passages would mean 800 round trips at an average of 140 passengers per trip.) The estimate of erosion is lower than in California at 7mph, though the boats are much larger, but it is very much an estimate (estimated number of passages, estimated under-measurement of erosion), not as carefully measured as the California studies, and in any case the shore materials are likely to be different. River banks were eroded at the water's edge, so many have become very steep, and undercut (a common pattern). It is very hard to establish protective vegetation on these steep and undercut surfaces. An early experiment in Tasmania has similar methodology to Alaska's, though with bigger boats Three tour boats (35-60 tons) went past a sandy shore repeatedly, at different speeds to generate different waves. Nanson et al (p.5) measured wave height in 3m of water, 21 m from the bank. Boats steered by a buoy 15 m farther out than the wave probe, 36m from the bank, in water 6m deep (p.6). Waves were measured by a capacitance probe and by videotaping the water level against a surveyor's staff. Erosion pins (2 x 200mm) were placed in the shore. They were removed, the bank was smoothed with a spade, and the pins were replaced after each passage, though they note that placement of pins disturbs the ground (p.6). They also pinned a pan in the water (at unknown depth or distance offshore) to catch some of the disturbed sediment (27 x 30 x 2cm, with a 1.5 x 1.5cm mesh placed 1.5cm from bottom to help keep sediment in place, though they saw that waves late in each wake did wash out some sediment which had collected earlier from the same wake). They took a grab sample of water 30 cm above the bottom (unknown depth & distance offshore), to measure sediment in the upper water. These two sediment measurements had high variability and did not seem as useful as the erosion pins. The best correlation of erosion was with the total power of significant waves, 93%. The correlation of erosion with height of the biggest wave was 73% (not statistically significant difference, for this sample size, p.12). Waves of 5 cm eroded 2-3mm of bank; and erosion rose steadily with wave height; 35cm waves eroded 20 mm of bank. A few much larger waves, up to 55 cm, eroded 40-70mm of bank. These experimental results were far higher than the average found for a year elsewhere on the river (0.06mm/boat passage). Part of the reason is that the experiment was done at an atypical shore of very loose sand, to identify differences with different types of waves. Most of the shores are cohesive clay. Speed limits therefore had substantial effect in reducing bank erosion (p.11). Erosion was 100cm/year from 1983-87, when speeds were 45-55kph and resulting waves were 50-100cm. Erosion dropped to 30cm/yr February-May 1987, when boats were restricted to 17 kph, with waves 30-50cm. Erosion dropped further to 6cm/yr from June 1987-June 1988 when boats were limited to waves < 30cm, and one trip per day, still at 17kph. Alaska Dept of Fish & Game cooperated with the US Geological Survey to measure erosion and the highest wave in each boat wake at several spots in 1996 on the Kenai River in south central Alaska (60.5N 151W). They were concerned because of decades of measurements of erosion. Sediments, which erode into the river because of fishing boat wakes, threatened the salmon which the boats were there to fish. They, like Tasmania, point out that natural river currents generally erode the outside of curves in rivers and deposit sediment on the inside of bends. They found unnatural semicircular pockets of water eroded on the inside of bends, up to 14 feet in diameter. They observed these being eroded by successive boat wakes. Motorboats are prohibited on part of the upper river, and are limited to 35 horsepower on the lower 50 miles. The banks sometimes have cohesive clay rich tills, and sometimes non-cohesive outwash alluvium from glaciers. For measuring erosion, they drove smooth steel rods horizontally into the banks. The rods ("pins") were generally 3/8 inch diameter by 36 inches (9.5mm x 91cm). Because of accessibility they were placed too high in the banks to measure undercuts at the water level, which seem to have been the largest form of erosion, as in Tasmania. In fact one pin was lost when four feet of bank slumped into an undercut, showing the need for very long pins or other methods to measure large losses. If only small losses are measured, the average loss will be seriously underestimated. For measuring wakes they used a float connected to a pen on paper slowly advancing (1.5 inches per hour, p.15) so all the waves from one wake were superimposed on the paper, and only the maximum wave could be discerned. The floats were close to the bank. In one case (Kenai Keys) the float was in front of a vertical wood retaining wall, where it might measure the combination of original waves and waves reflected off the wall. It was typical for boats to power upstream and float with current downstream, so only the powered passages caused wakes and were counted. Each of the three wake gages malfunctioned and did not record data for major parts of the summer. The authors used parallels in river usage between sites to estimate boat passages when gages were not working. They also measured sediment which was suspended by a wake and which settled in a pan 12" x 18" x 2" deep (30.5cm x 45.7cm x 5.1cm) "pinned to the river bottom near the base of the streambank." (p.19) They did not say exactly how far it was from the bank, how long was allowed for settling, nor how the contents were prepared for weighing. They also bottled water samples in a "submerged bottle" (no details of location or timing), so they recognized that fine sediments would stay suspended and needed to be sampled in the bottle. The quantities of sediment collected by both methods were highly variable for given wave heights, but the maximum did rise with increasing wave heights. The smallest waves they observed (0.18 feet or 2.16 inches or 55mm) still caused erosion, as measured by presence of sediment in the collection pan. From this size wake they measured 0.03 pounds (0.48 ounces or 14g) of sediment in the pan, which collected part of the erosion from about 1 foot of bank (30.5cm). At a density of 125 pounds/cubic foot (Bauer, since Alaska did not provide data), this is 0.4mm deep on a face 0.18 feet high by 1 foot wide. This is a substantial underestimate, because the pan would not collect all sediment raised from 1 linear foot of bank. The experimental area thus seems more erodible or otherwise different from the average shown in the table above. The largest erosion they measured in the pan was 1.35 pounds from a wake .91 feet high, which would represent erosion 3.6 mm deep. Bank protection methods (anchored tree trunks, willows, wood & stone walls) all worked to prevent erosion behind them. One set of anchored tree trunks broke loose, and others would rot, so they need periodic maintenance. Anchored trees have the benefit of trapping sediment and protecting fish, but when they break loose they can cause blockage and higher flood waters downstream. One wood barrier was simply a wide board attached to a tree trunk at the annual high water mark, to prevent erosion at that height. The descriptions do not have enough detail, variety of locations, or length of observation to give strong results on advantages of each method. Effects of boatwakes on streambank erosion, Kenai River, Alaska, Dorava, J.M., and Moore, G.W., 1997, U.S. Geological Survey Water-Resources Investigations Report 97-4105, 84 p.